Scott Murphy, brother of the late Kate Murphy with his parents Vivienne and Hilary speaking to the Waterford News & Star outside the Courthouse in Catherine Street last Tuesday. “I STILL smell the embalming oil when I should be smelling perfume,” sobbed the heartbroken father of his 16-year-old only daughter who died in a horrific single vehicle crash in Tramore on October 5, 2016. Hilary Murphy of Castlewoods, Ballinamona, Waterford, was speaking outside Waterford Circuit Criminal Court last week, following the sentencing of the driver of the car, Edward O’Shea, who was convicted, by a jury, of careless driving causing death, two counts of careless driving causing serious injury and for driving with a provisional licence while unaccompanied. O’Shea of Magnh, Fenor, Waterford, was jailed for 14 months. In February he had been acquitted of dangerous driving. Earlier taking to the witness stand to read a Victim Impact Statement Vivienne Murphy spoke of her devastation at the loss of her only daughter. “It is a tragedy that she died suddenly – she died because of someone else’s actions and that is the greatest tragedy of all,” she said. Continuing, she said that it was her belief that when we made mistakes we made amends for them but that had not been done by Edward O’Shea who was driving the modified Japanese car on the evening of the fatal crash. Amid the tears she described Kate as “the most beautiful person inside and out”. She was “extraordinarily caring and compassionate” and had been taken away by careless selfish actions. Continuing, she said: “I will forever have one foot in this world and one in the next.” She told how she continued to have flashbacks about her 16-year-old daughter being dead and she added, “I am now sentenced to a life of nothingness.” Kate’s bedroom door was her biggest nightmare because it held hope where there was no hope to be found. Kate, she said, died every morning and she was missed at every family occasion. “I will never know peace again. Kate is my present, my past and my future. Her loss does not get better. It will not get easier and I will try to keep her memory alive forever,” she said. Scott Murphy spoke of his late sister’s humour, warmth and sense of fun, how he would miss her company and how she had missed out on all the things in life like being a bridesmaid, a bride and an aunt. 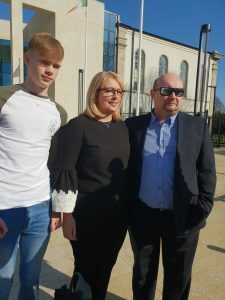 Kate’s dad, Hilary said the lives of his family had been totally devastated by the loss of their only daughter in a crash which they insisted was entirely avoidable and due to O’Shea’s carelessness. He spoke of how difficult it was to “go to town” and how it made them cry to see clothes which Kate would love but would never have. They also frequently had to go home again when they saw people out shopping with their daughters and they would never have that. Mr. Murphy described Edward O’Shea as “a very cold-hearted person” who had not spoken to his family, sent a letter, card or flowers over their daughter’s death. Mr Murphy urged Judge Eugene O’Kelly not to adopt a “soft touch” approach to sentencing and to take the opportunity to send out a deterrent message to other Irish road users and he challenged that on the evening of the fatality Edward O’Shea had been showing off in a high powered car. The family’s outlook on life had changed. They had lost their freedom and they now found it difficult to be out in company. Mr. Murphy said he relied on prescription drugs to get through each day, and depression and anxiety was every day. He and his wife had been deprived of the joy of seeing their daughter grow up and in her memory they had set up a road safety campaign called Odd Socks for Katie, which was aimed at urging drivers to slow down and drive with care at all times. He also urged young people worried about a driver’s speed to have the courage to demand to get out of the vehicle. “Have the courage to say: ‘Stop and let me out.’ Your parents will come and collect you. No parent wants their child to arrive home in a hearse. “I don’t want any other family to go through the nightmare that we have endured since 2016,” Mr Murphy said.